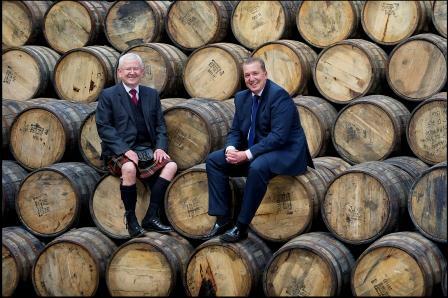 East Kilbride based Burn Stewart Distillers, producers of Scottish Leader, Black Bottle, Bunnahabhain, Tobermory, Deanston and Ledaig whiskies, today announced its financial results for the year ended 31stDecember 2011. The company, which employs 250 people across its distilling, blending, bottling, commercial and administration activities, has implemented long-term strategies of investment in the value of its core brands and relationship building in niche markets. Sales growth across the core brands is up 13% in volume and 27% in revenue with Scottish Leader driving the growth in the blends and Bunnahabhain leading the single malt growth. The company continues to invest in capital expenditure to a total of £0.8m in 2011 taking the investment for the last 3 years to £2.0m. Current investment includes completion of a £0.6m visitor centre at Deanston Distillery in Doune, which opened in June 2012, creating 7 new jobs and significantly enhancing the retail and consumer experience of the brand. As the company relentlessly continues to drive its core branded portfolio, a £0.5m investment in a new high specification bottling line is currently underway at East Kilbride which will improve delivery of Burn Stewart’s Single Malt brand strategy. One of the company’s most important export markets is Taiwan, where Burn Stewart first traded in 1993, opening its branch two years later, which now employs 35 people. The company’s flagship brand, Scottish Leader, has recently become the market leader in Taiwan in the “standard blended Scotch’’ category. Growth is also strong in Sub-Saharan Africa, the UK, and the US, France, the Baltics and parts of Eastern Europe. In all regions the company has nurtured long-term partnerships and focus in specific channels of trade. “I am pleased that our results clearly demonstrate our ability to deliver our long-term strategy combining capital expenditure on value adding projects and relationship building in niche markets. We have confidence in the Scotch whisky sector, our brands and the ability of our people to produce and market them. The company plans further investment in capital projects over the next 3 years to further enhance the capability of the business and its competitiveness. Burn Stewart Distillers Ltd is a fully integrated Scotch whisky producer and brand owner with three single malt whisky distilleries and a strong portfolio of Scotch whisky brands. The company’s head office and bottling hall are based in East Kilbride, with blending and warehousing facilities at Airdrie, both near Glasgow. The three distilleries include: Deanston in Doune, Perthshire; Bunnahabhain on the Isle of Islay and Tobermory based on the Isle of Mull. Burn Stewart produces and markets a well balanced range of Scotch whisky brands to appeal to every type of Scotch consumer and distributes to over 60 markets worldwide.